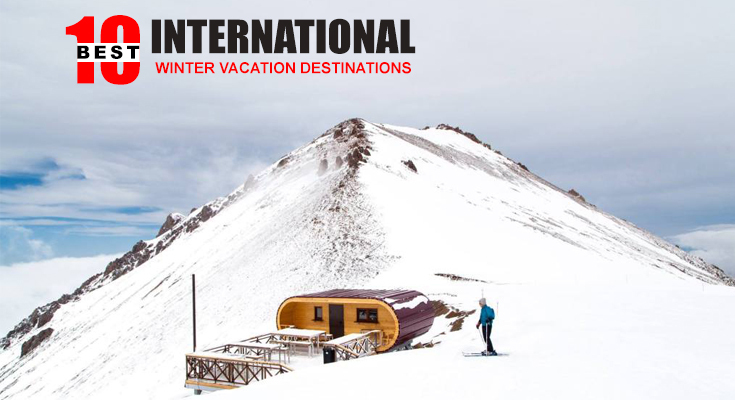 Winter is a time to travel to some destinations which really has amazing winter attractions. 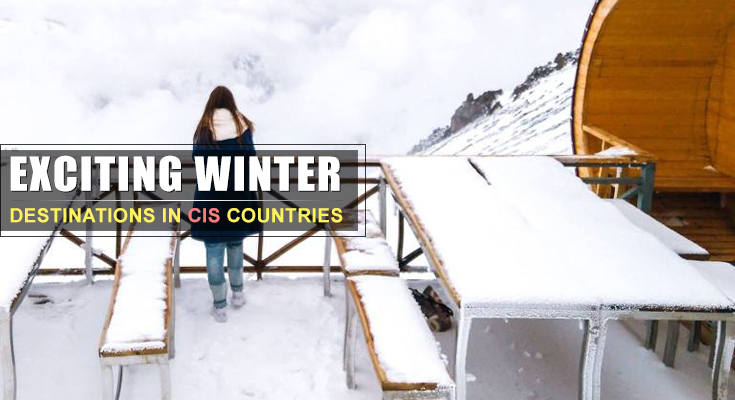 There are some truly amazing winter vacation destinations where you can plan to go this winter season. The season has its charm because snow covered mountains and winter adventure sports are highlights of such winter holiday destinations. There are some truly wonderful places in Central Asia, Caucasus region and Europe where you can expect best winter trips. In this article we will see Top 10 International Winter Vacation Destinations for Indian Tourists. Almaty is a great location in all season. However it also offers best winter trips. The city is full of mountains. Winter is best time to take best winter trip to Almaty. During winters, Almaty turns a hot travel destination for adventure lovers. 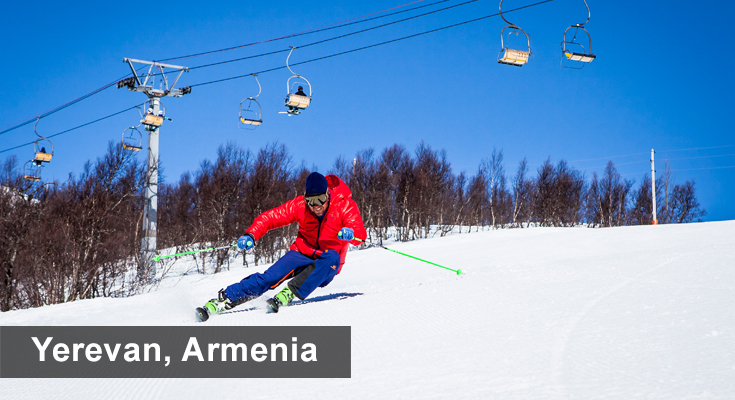 You can enjoy skiing, snowboarding and other winter sports in Almaty. Almaty has earned a special place among top exciting winter vacation spots as visitors are spoilt for choices in winters here. Medeu is a special attraction in Almaty which is known as world’s highest skating rink and it is located merely 15 KM southeast of Almaty. 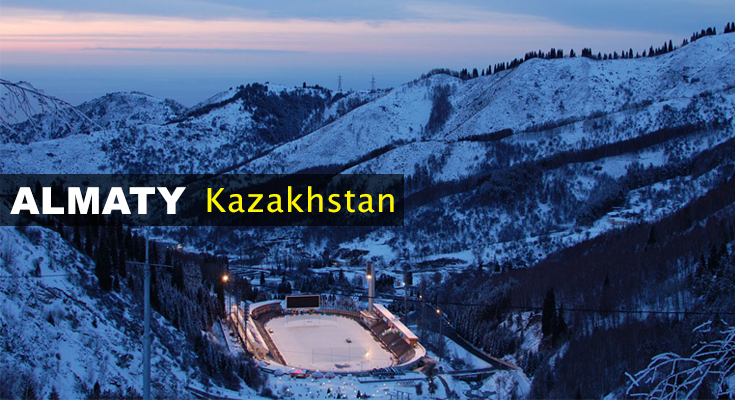 Things To Do in Almaty, Kazakhstan: There are plenty of options for visitors in winters. People can simply enjoy snow covered mountains in and around the city. Real fun for adventure sports lovers starts at 5500 feet above sea level at Medeu. Here you can go for Skiing, snowboarding and ice-skating. And after hard work, those who want to relax on a winter day can go to Arasan Baths. You can also stay warm by entering Almaty’s Abay Opera house where you can explore Almaty culture. Apart from these special winter attractions all other attractions remain open during winters as well. Ideal Duration: Ideal duration is 5 days Almaty winter tour. Tashkent is a place worth visiting anytime of the year. The city, once on the famous Silk Road looks like a reminiscent of former Soviet times. Tashkent is capital city of Uzbekistan. Tashkent is a wonderful city where you can see medieval buildings, European Architectures, Soviet Style buildings and modern skyscrapers of glass and concrete all at one place. Not just that Tashkent is also among one of the top international destinations you must visit this winter. Tashkent has some beautiful places which one can explore during winters. However, in all seasons you can explore beautiful museums, old town of Tashkent, famous Bazaars and so on in Tashkent. Things To Do in Tashkent, Uzbekistan: You will get variety of winter vacation ideas in Tashkent. 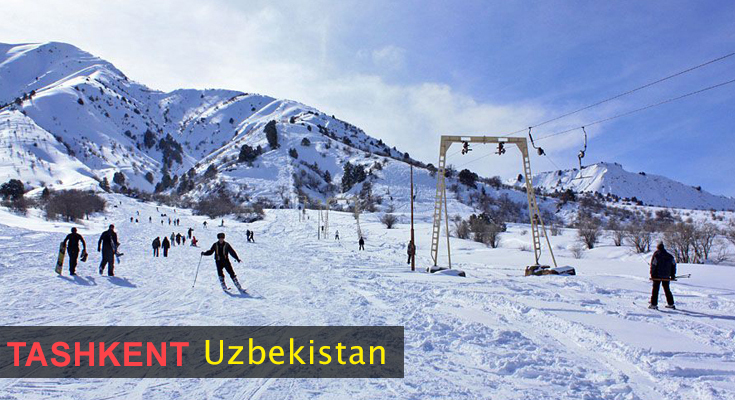 Most popular ski resort of Uzbekistan is only 80 KM away from Tashkent in Chimgan Mountains. People from different parts of the world come here to enjoy skiing in Chimgan Valley. You can also enjoy skiing, rafting and hiking in yet another winter attraction in Tashkent which is Ugam-chatkal national park stretching out to Tien Shan Mountains. Ideal Duration: Ideal duration for best winter trip to Tashkent is 5 days trip. Saint Petersburg along with Moscow is one of the two most popular destinations in Russia. This is definitely a place for cold winter vacations. St. Petersburg is truly a unique and beautiful city. This is known as home of Tsars and also one of the world’s best romantic places. St. Petersburg is known as capital of Russian art, culture and literature. Entire central part of the city is a UNESCO World Heritage site which has some amazing palaces and buildings which include famous Winter Palace. 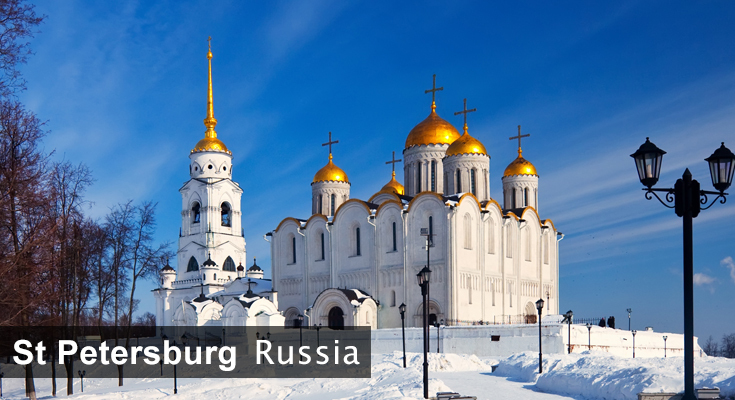 St. Petersburg is one of the most favorite winter vacation destinations for Indian. Things To Do in Saint Petersburg, Russia: You will be spoilt for choices in St. Petersburg. It is a very special winter holiday destination. You can see the famous Winter Palace. World famous Hermitage Museum is a place to visit in all season. Sitting on the bank of Neva River and known as Venice of the North, St. Petersburg is home to several Cathedral, islands, fortresses, bridges and canals. Some popular attractions of the city are Kazan Cathedral, St. Isaac Cathedral, Peter and Paul fortress, Grand Palace and more. Ideal Duration: Ideal duration for exciting winter vacation in St. Petersburg is 3-5 days and even more. Baku is the capital city of Azerbaijan. Azerbaijan is known popularly as ‘Land of fire’. This land is combination of ancient culture and modernity. Old City (Icheri Sheher) is one of the most popular streets in Baku where you can walk in narrow lane. You can see the culture and tradition of the land in Old city of Baku. Baku is a good choice as a winter vacation destination also. Though winters are cold in Baku however weather is generally good. So, you can enjoy the city very much. Things To Do in Baku, Azerbaijan: Winter in Baku is really a nice experience. You can go for ice skating, skiing and climbing snow covered mountains. 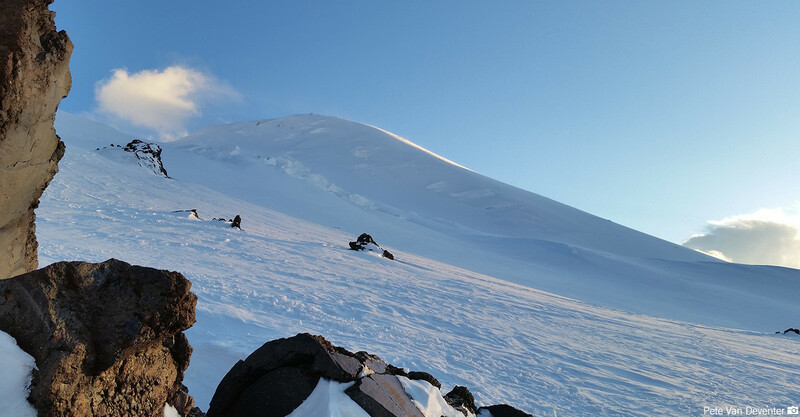 Shahdag Ski Resort offers world class skiing facilities along with recreational and cultural experiences. 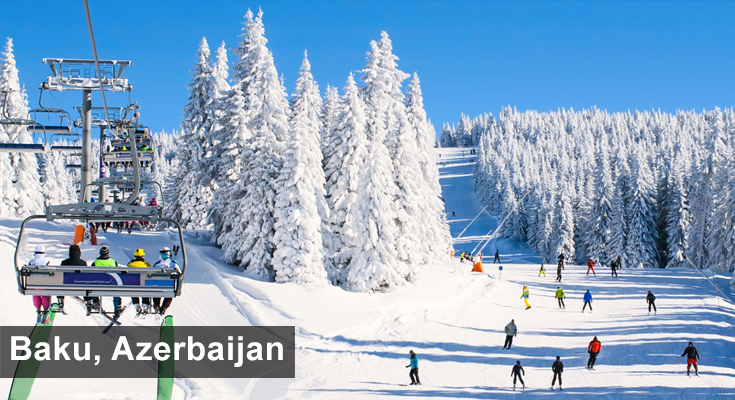 There are other winter vacation ideas to explore in Baku as well. One of them is Absheron Peninsula which is only 50 KM away from Baku. You also cannot forget to see ‘Temple of Fire’ Ateshgah and a trip to Gobustan will let you experience rock art sites of ancient human Neolithic period. 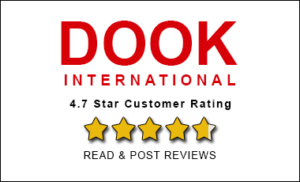 Ideal Duration: Ideal duration for best winter trip to Baku is 4-5 days. Kiev is the capital city of Ukraine. Kiev is seeing a tourism boom. Located on the banks of Dnieper River, Kiev is a wonderful mix of Post-Soviet Eastern Europe, centuries of history, rich heritage of culture and in current times an urbane cosmopolitan space. 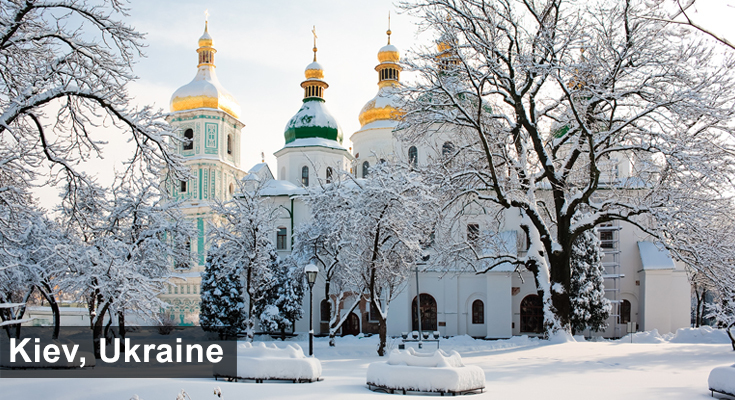 Though a place to visit in all seasons, Kiev is certainly a place you can choose for cold winter vacations. Kiev is known as ‘Hidden Jewel of Eastern Europe’ and it is fast becoming one of the coolest places in Europe to visit. Without a doubt Kiev is the most beautiful city among all Post-Soviet countries and this is a place where east meets west. Things To Do in Kiev, Ukraine: Winter in Kyiv is a special time. This is a time of entertainments and New Year’s public holidays. Lot of beautiful decoration, fully illuminated city and many festive events are held in the city during this time. Kiev can surely be one of the best winter vacation destinations for Indians. You have plenty of choices like ice skating rinks indoor and outdoor, skiing option in Protasov Yar, and fishing as well. You can do whatever you prefer to do. If you prefer indoor events in winters, then you can experience Kiev Museums which are excellent places to visit in winters. Ideal Duration: Ideal duration to Kiev, an international destination you must visit this winter is 4-5 days. Bulgaria is a wonderful place. Sofia is the capital city of Bulgaria. Sofia is located at the foot of Vitosha Mountain in the western part of Bulgaria. Sofia has over 7000 years of history. You can witness this in Sofia History Museum. In current times the city is hometown of major universities, commercial activities and cultural institutions. Sofia is also a place known as winter vacation destination. Depending on which part of the world you come from, you need to adapt to winters in Sofia. However everyone can enjoy this beautiful city during winters. Things To Do in Sofia, Bulgaria: Best thing about Sofia is that the city is surrounded by mountains. Nearly 20 minutes from the center of Sofia is Vitosha Mountain which is a great place to enjoy adventure activities like hiking, bike riding, skiing and also paragliding. 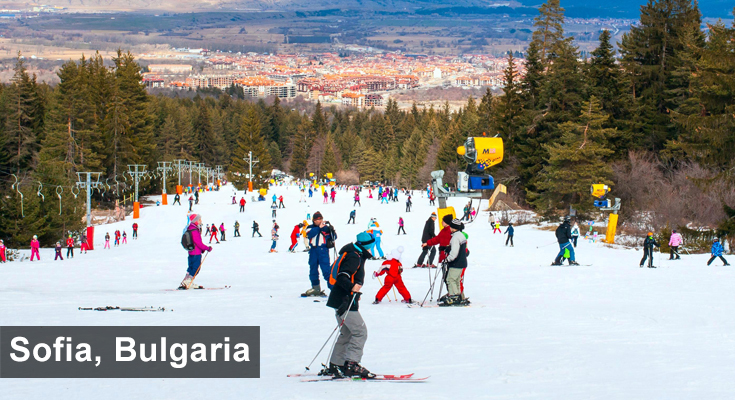 If you want to explore Sofia as winter vacation idea then you can take a short drive from Sofia, and you will find smaller and less crowded ski resorts. You can also go for ice skating in the biggest open air ice rink on the Balkans – the Ariana Lake. So, you have lots of fun things to do in Sofia in winters. Ideal Duration: Ideal duration to Sofia in winters is 3-4 days. Serbia is a country in Balkans in southeast Europe. Serbia is located at the cross road of Central Asia and South East Europe. Belgrade is the capital city of Serbia. Belgrade is one of the most beautiful cities in the world. Belgrade has a long history, welcoming people and lot of attractions. Belgrade has special charm during winters which makes it special winter holiday destination. When you take a walk on the Knez Mihailova Street, when you visit the largest orthodox temple at Balkans and when you visit Kalemegdan Fortress, Museums, theaters and galleries in Belgrade you know that you have a lifetime travel experience. Things To Do in Belgrade, Serbia: Winter in Belgrade is super cool. You can go to Belgrade if you are planning to go to a cold winter vacation. In the winter, city is super beautiful as the whole city is decorated with sparkling multicolor lamps for Christmas and New Year celebrations. For warmth in cold you can enter a restaurant in the city. In the snowy winter in Belgrade you can also visit the St. Sava Temple in the old city which is the largest Orthodox temple in Serbia. This is a must see attractions for visitors. 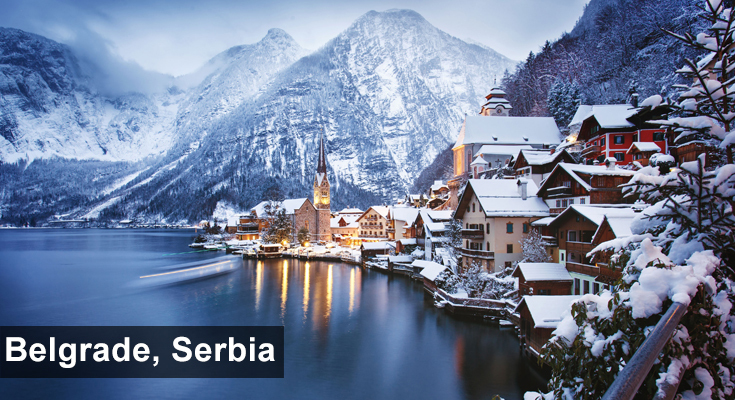 Ideal Duration: If you are going to Belgrade, Serbia for an exciting winter vacation then you should go for a 4-5 days trip. Bishkek is the capital city of Kyrgyzstan. Bishkek is a historical city with modern infrastructure in place. Kyrgyzstan is a country surrounded by mountains. However Bishkek is a city full of colorful streets, Bazaars, museums and popular squares. Bishkek is also a good winter holiday destination. Kyrgyz Ala Too Mountain which is only 40 KM away from Bishkek provides spectacular backdrop to Bishkek especially in winter. Ala Archa national park is also only 30-45 minute drive from Bishkek. Within the city world famous Osh Bazaar is a must see in any season. And you must spend some good time in and around Ala too square in the center of the city. Things To Do in Bishkek, Kyrgyzstan: Bishkek is a wonderful winter vacation destination. There are several ski resorts just outside the city. Largest one is near the town of Karakol in Tien Shan Mountain ranges. 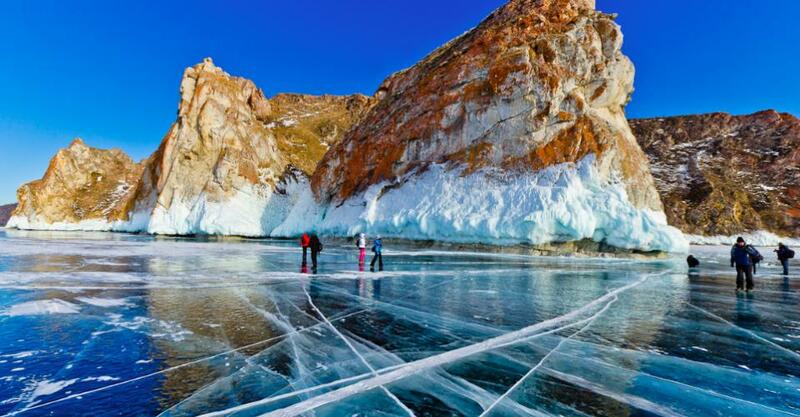 Don’t forget to go to Issyk Kul Lake; the seventh deepest lake in the world. This is only few hour drive from Bishkek. And after you are tired of climbing, skiing and other activities on the mountains you can relax at traditional bath houses in Bishkek. Other than this Bishkek city is always beautiful and winter is no exception. So, you can be in Bishkek during winters for a good time. 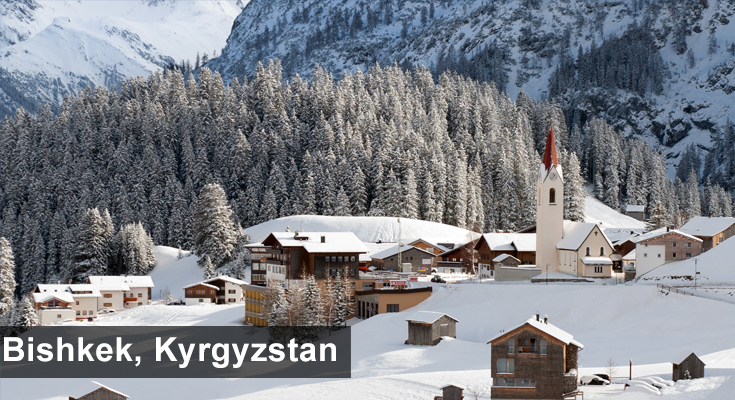 Ideal Duration: To explore winter vacation ideas in Bishkek, Kyrgyzstan you need 4-6 days. Capital city of Armenia, Yerevan is a special place to be in winter. Armenia is country of mountains and Yerevan is surrounded by mountains too. Yerevan is pink in color with most of its buildings garnished with pink shaded stones. This is why Yerevan is referred as ‘Pink Yerevan’ also. The city and the country have very long history and this is the place where Christianity was first adapted as religion. You can include Yerevan as International destination you must visit this winter. This is because snow covered mountains here create breathtaking views. Apart from scenic beauties, there are plenty of tourist sites in Yerevan and most of them are concentrated in the center. During winter you can visit this place for wonderful experience. Know more about “Armenia Tourism“! Things To Do in Yerevan, Armenia: New Year celebration is one of the best things to witness in Yerevan. Winter or no winter you must be at Matenadaran in Yerevan which is one of the largest repositories of ancient manuscripts in the world. Then you can visit other prime attractions which include Echmiadzin, ruins of Zvartnots, Khor Virap Monasteries, Garni temple and Ski resorts nearby Yerevan. Don’t forget to visit Lake Sevan which is the largest water body in Armenia and in entire Caucasus region when you go to Yerevan for best winter trip. Ideal Duration: Yerevan has everything to be winter vacation destination for Indian where they can spend 4-5 days for an ideal trip. Chisinau is the capital city and also the largest city of Moldova. You can walk in the city and get the feel of the place. Natural landscapes and history of the country are the city’s main attraction for the visitors. City has several lakes, innumerable parks and varied wildlife. Chisinau is a good option for exciting winter vacation. It has huge proportions of natural spaces. 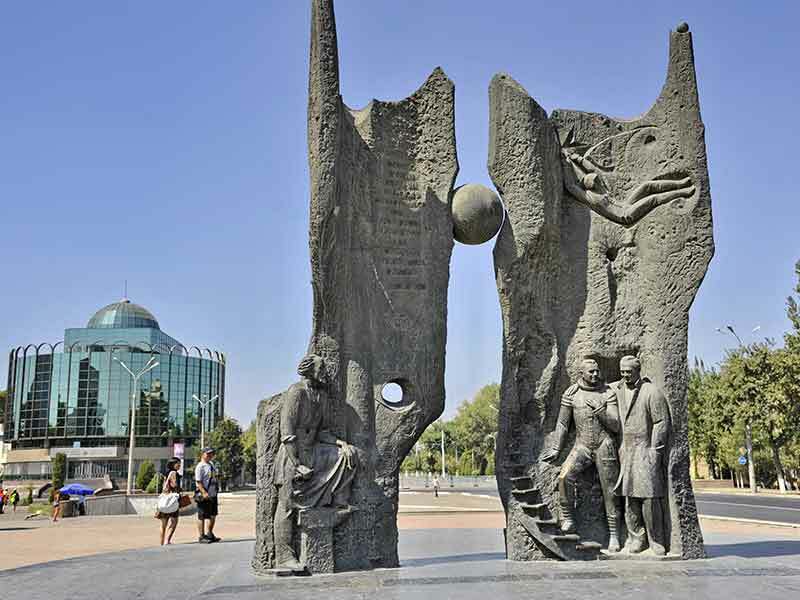 Also known as green capital, Chisinau is situated on the Bic River, surrounded by fertile land rife with vineyards. This is why Chisinau is also a popular destination for wine tours. Things To Do in Chisinau, Moldova: Chisinau is famous for wine tours. You can start your wine experience on day one when you arrive here. The city is also popular for its cognac and its award-winning beer. So you are suggested to arrive thirsty here. Chisinau is beautiful during Christmas. Christmas markets, decorations and lightings are super attractive here. The city will be a good choice for winter holiday destination. 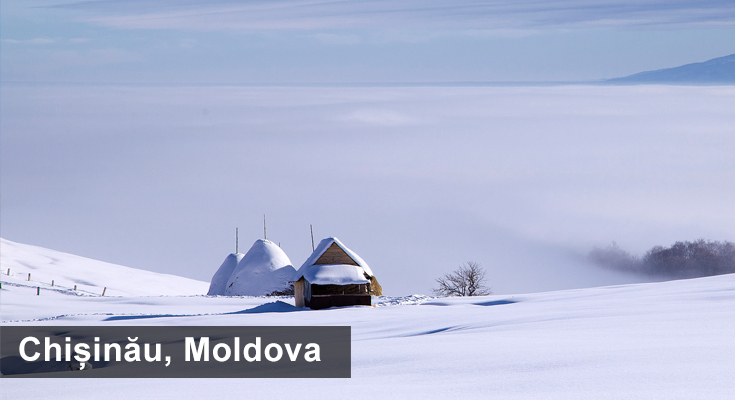 Ideal Duration: Ideal duration to a winter visit to Chisinau, Moldova is 3-4 days.